The Marshall Space Flight Center Vector Magnetograph Facility was assembled in 1973 to support the Skylab mission. The instrument was designed by Dr. Guenther Brueckner of the Naval Research Laboratory and housed in an enclosure at the top of a 40-foot tower. Improvements to the vector magnetograph in 1976 by Solar Physics Branch member Ed West, produced a world-class instrument that has illustrated the usefulness of reliable vector magnetic field measurements for understanding solar magnetism and its role in processes such as solar flares. The facility added a co-aligned H-alpha telescope in 1989. This instrument was built as a backup for an H-alpha telescope which flew on Skylab's Apollo Telescope Mount (ATM); it has a bandpass of 1 Å. Images from this telescope provide a view of chromospheric structures, flare activity, and additional information on the orientation of the magnetic field in active regions. This photograph of the magnetograph shows the gold plated H-alpha telescope mounted on the side of the magnetograph telescope. James Smith (retired), former chief observer, is shown attending to the instrument. To take advantage of more up-to-date technology, the magnetograph was again upgraded in 1999/2000. The upgrade consisted of installing a new CCD camera and data acquisition system. With the new CCD, the spatial resolution over the 6 x 6 arcmin field of view was increased to 0.64 arcsec per pixel (binning 1 x 1), an improvement by a factor of 5 over the former detector. The new system is also faster (3 minutes for a full vector magnetogram) and much more versatile with its new computer system and much larger memory. We began observations with this system on September 14, 2000. 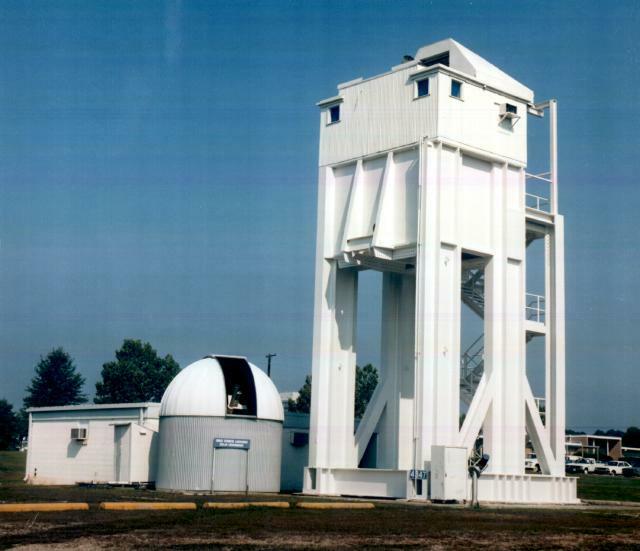 In the fall of 2005 the instrument was moved to its current location atop the Physics/Optics Building on the University of Alabama, Huntsville campus. This new location makes the instrument available for use by students. Operations of the magnetograph have been impaired by the retirement of Dr. Mona Hagyard, a careful scientist and a driving force in maintaining research with this instrument. The magnetograph works by measuring the polarization of light at various wavelength positions within a solar spectral line. Circular polarization in the opposite sense on either side of a magnetically sensitive spectral line gives a measure of the longitudinal magnetic field (the strength of the field directed toward and away from the instrument). Linear polarization provides information on the strength and direction of the magnetic field transverse to the line of sight. A more complete description of vector magnetographs and their operation can be found here. DAILY MAGNETOGRAMS, recent vector magnetograms and archived data are available through links on our Daily Images Page. EDUCATORS, if your class would like to learn more about the Sun, follow this link to our Help for Teachers Page. GIRL SCOUTS, Especially for YOU! Follow this link to find Activities and Pictures.